Five decades after the Revolutionary War, the United States approached a constitutional crisis. At its center stood two former military comrades locked in a struggle that tested the boundaries of our fledgling democracy. One man we recognize: Andrew Jackson—war hero, populist, and exemplar of the expanding South—whose first major initiative as president instigated the massive expulsion of Native Americans known as the Trail of Tears. The other is a half-forgotten figure: John Ross—a mixed-race Cherokee politician and diplomat—who used the United States’ own legal system and democratic ideals to oppose Jackson. Representing one of the Five Civilized Tribes who had adopted the ways of white settlers, Ross championed the tribes’ cause all the way to the Supreme Court, gaining allies like Senator Henry Clay, Chief Justice John Marshall, and even Davy Crockett. Ross and his allies made their case in the media, committed civil disobedience, and benefited from the first mass political action by American women. Their struggle contained ominous overtures of later events like the Civil War and defined the political culture for much that followed. 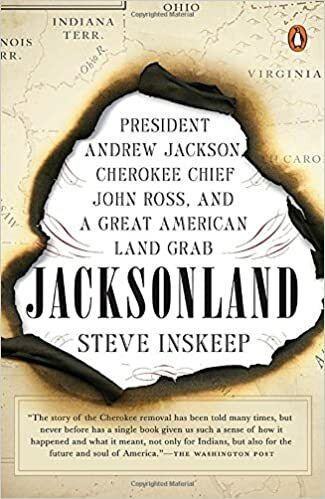 Jacksonland is the work of renowned journalist Steve Inskeep, cohost of NPR’s Morning Edition, who offers a heart-stopping narrative masterpiece, a tragedy of American history that feels ripped from the headlines in its immediacy, drama, and relevance to our lives. Jacksonland is the story of America at a moment of transition, when the fate of states and nations was decided by the actions of two heroic yet tragically opposed men.